RED ALERT! - I Blog, Therefore I Am. I'll be talking about RED in honor of the love month! People assume that I have rosy cheeks. Well - I actually have rosy cheeks but it's not a "healthy glow" - much to my disappointment. A consultation with Belo Medical Clinic last year confirmed that I have Rosacea ["roh-ZAY-sha"]. Rosacea is a common skin condition that causes redness in the face and it often produce these nasty bumps called papules which cannot be treated by the usual facial. Rosacea doesn't have any cure but it can be managed with proper care. Red "flare ups" are usually triggered by sun exposure, emotional stress, hot beverages/soups, alcohol, and even spicy food. I am not too concerned about the red flare-ups but I am very much irritated-annoyed-sad about the bumpy papules and pustules that also came with Rosacea. I am particularly frustrated with these bumps because of our upcoming wedding in December. I've had five (5) trial make-ups in the last month with four using airbrush as cover-up. The make-up covered the redness and evened the skin tones but they cannot hide the bumps especially if you look up close. A quick Internet search led me to the Rosacea line of VMV Hypoallergenics. VMV is one of my go-to brands in my early 20s. I break-out easily when I was younger and the only powder foundation I can use then were VMV and Neutrogena. 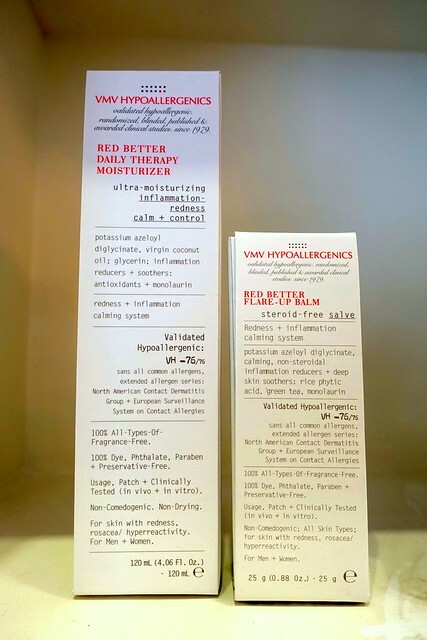 The VMV Hypoallergenics for the Rosacea line is called Red Better. I bought the Red Better Daily Cleanser, Red Better Daily Therapy Moisturizer, and the Red Better Spot Corrector three Saturdays ago. The cleanser and moisturizer lessens the redness a few minutes after application. The cleanser is refreshing and I even wanted to bring it to work and clean my face every two hours since the flare-ups are lesser after each use. The Red Better Spot Corrector is very good in drying pimples and acne. I was able to clear and dry a big zit in less than 4 days. The SAs in VMV told me that the Spot Corrector is a best-seller even to none Rosacea patients because of its drying capabilities (think Mario Badescu or Panoxyl but better) and I truly attest to this. 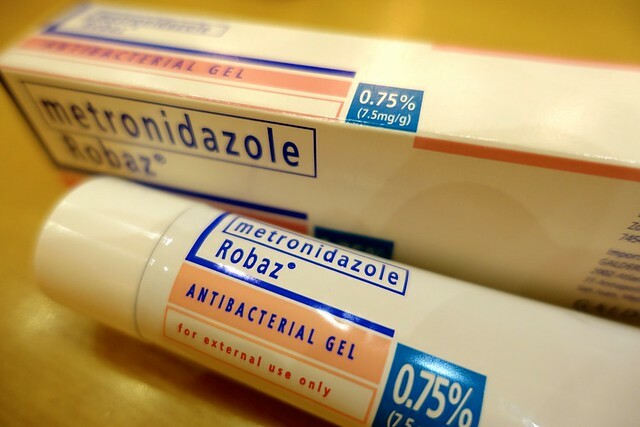 Robaz Antibacterial Gel is a popular Rosacea topical treatment made of 0.75% Metronidazole. I was able to search about it a month ago but I was told by Mercury Drug that they phased it out in 2008. Robaz is the only cream that I was able to search that yielded positive feedback in the management of Rosacea. I was about to order from Amazon but was very fortunate that my dermalogist has some on her stash. Aside from Metronidazole, it also got purified water, methylparaben, propylene glycol, carbomer 940, and disodium edetate. No need to swatch the cream - it's gel-like, transparent and quite watery so it will not be too visible in photos. I love applying it! It's very easy to apply and it's absorb by the skin easily. It's also non-sticky and has no fragrance. My skin has a smooth-feel after I apply it. It's one of the best topical gel I had in my entire life! The literature says that significant therapeutic improvements can be seen in 3 weeks with continuing improvements in 9 weeks. I'll reserve my full review until then. I switched back to Cetaphil and stopped using VMV Red Better Daily Cleanser but I'll observe in a couple of days and try it with the VMV Cleanser. I'll test the better combination. The 30g is Php 1,500 and I can see it lasting for 2 months with twice a day use. 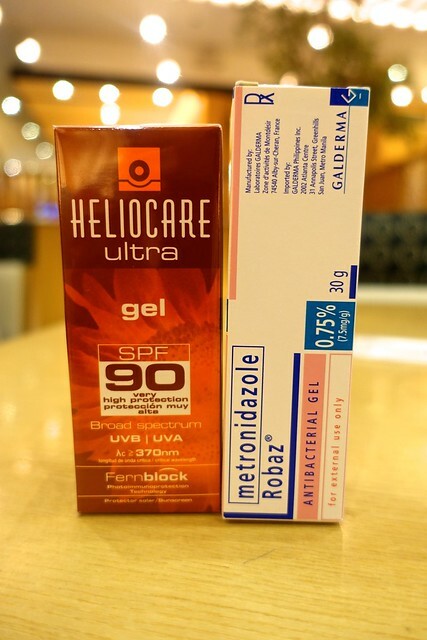 I haven't used yet the Heliocare Ultra Gel but I got it for Php 2,500 at Regenery. It's also recommended for Rosacea and acne-prone skin. Observe your face and triggers. Try to use Clinique Redness Solution kit, it is specially made for rosacea, I tried it once, so far it doesn't trigger my flare-ups, usually when I try other products it triggers my flare-ups then I will stop using it. And don't stress out, sometimes it triggers too.. Drink lots of water. Hope it helps. Thanks, Ms. Anonymous. I'd check that out as well. As for me - my Rosacea greatly improved especially the Papules and Postules. I was prescribed Desowen Cream but I only use it on my ugly flare up days or when I have annoying bumps or even pimples. It's steroids so I only use it when I really need help. Heliocare was also good. I use it everyday. I also tested and retested products/make-ups which suits me. It was a struggle but I am getting there. I'll need to update this blog on Rosacea. Stay tuned.